Holkham Hall01328 710227work Historic HouseHolkham is a special place where a stunning coastal landscape meets one of England’s great agricultural estates. At the heart of this thriving 25,000 acre estate on the north Norfolk coast, stands Holkham Hall, an elegant 18th century Palladian style house, based on designs by William Kent and built by Thomas Coke, 1st Earl of Leicester. The house remains privately-owned and is the home to the Earls of Leicester. The Marble Hall is a spectacular introduction to this imposing building, with its 50ft pressed plaster dome ceiling and walls of English alabaster, not marble as its name implies. Stairs lead to magnificent state rooms displaying superb collections of ancient statuary, original furniture, tapestries and paintings by Rubens, Van Dyck, Claude, Gaspar Poussin and Gainsborough. New for 2019! We are delighted to be opening up two new rooms in the hall for visitors to see; the sumptuous Venetian Bedroom and The Old Servants’ Hall. Discover more with the Field to Fork Experience, which tells the story of Holkham’s unique farming history. Let our ‘talking tools’ tell you what they were used for; find out who puts the malt in Maltesers; discover why cow pats are so important; take your turn at milling flour; test your foody knowledge with our quick-fire table-top game; sit back and enjoy our beautiful ‘Holkham Year’ film; don those Holkham tweeds and Bowler hats and dress up as a Holkham gamekeeper – with smells to sniff, buttons to press and drawers to open you’ll really enjoy discovering farming without having to put your wellies on! The house is surrounded by rolling parkland with opportunities to discover the wildlife and landscape with nature trails, cycle and boat hire on Holkham lake. Children can enjoy the exciting woodland adventure play area where there’s an amazing tree house, high level walkways, rope ladders and fun zip wire. Visit the 18th century walled garden to the west of the hall to enjoy the peaceful and tranquil setting and see the ongoing restoration project to sensitively restore the 6 acres of gardens to its former glory. Your visit must include the Courtyard Café and Gift Shop, both showcasing the work and produce of local artisan suppliers. 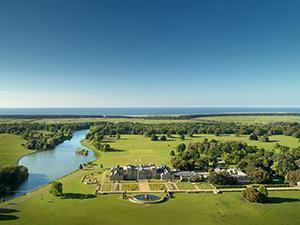 Holkham is a special place where a stunning coastal landscape meets one of England’s great agricultural estates. At the heart of this thriving 25,000 acre estate on the north Norfolk coast, stands Holkham Hall, an elegant 18th century Palladian style house, based on designs by William Kent and built by Thomas Coke, 1st Earl of Leicester. The house remains privately-owned and is the home to the Earls of Leicester. The Lookout on Lady Anne's Drive provides visitors to Holkham National Nature Reserve and beach with lavatories, a modest refreshment facility and interpretation on the habitats and wildlife on the reserve. The Lookout blends perfectly into this sensitive landscape and offers spectacular views. It is also committed to reducing waste and aims to be free of single-use plastic. The Hall is open Sundays, Mondays and Thursdays only, 12noon-4pm. Holkham Hall, Field to Fork Experience and Walled Garden: Adult: £16.00, Child (5-16 years incl. ): £8.00, Family (2 adults and up to 3 children 5-16 years incl. ): £44.00 NB: For special children’s events the child age is 2-16 years inc.
Field to Fork Experience and Walled Garden: Adult: £7.50, Child (5-16 years incl. ): £3.75, Family: (2 adults and up to 3 children 5-16 years incl. ): £21.00 NB: For special children’s events the child age is 2-16 years inc.
Field to Fork Experience Only: Adult: £5.00, Child (5-16 years incl. ): £2.50, Family (2 adults and up to 3 children 5-16 years incl. ): £13.50. Walled Garden Only: Adult: £3.00, Child (5-16 years incl. ): £1.50 NB: Walled Garden only tickets are not available for special children’s events such as Easter and Halloween. Please note that Walled Garden only tickets are not available to buy online.